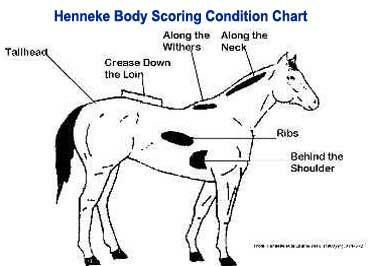 The Henneke System is an objective evaluation of a horse's body condition. Developed in 1983 by Don R. Henneke, Ph.D., of Tarleton State Texas University, it is based on both visual appraisal and palpable fat cover of the six major points of the horse that are most responsive to changes in body fat. Emaciated. Prominent spinous processes, ribs, tailhead and hooks and pins. Noticeable bone structure on withers, shoulders and neck. No fatty tissues can be palpated. Emaciated. Slight fat covering over base of spinous processes. Transverse processes of lumbar vertebrae feel rounded. Prominent spinous processes, ribs, tailhead and hooks and pins. Withers, shoulders and neck structures faintly discernible. Fat built up about halfway on spinous processes, transverse processes cannot be felt. Slight fat cover over ribs. Spinous processes and ribs easily discernible. Tailhead prominent, but individual vertebrae cannot be visually identified. Hook bones appear rounded, but easily discernible. Pin bones not distinguishable. Withers, shoulders and neck accentuated. Negative crease along back. Faint outline of ribs discernible. Tailhead prominence depends on conformation, fat can be felt around it. Hook bones not discernible. Withers, shoulders and neck not obviously thin. Back is level. Ribs cannot be visually distinguished, but can be easily felt. Fat around tailhead beginning to feel spongy. Withers appear rounded over spinous processes. Shoulders and neck blend smoothly into body. May have slight crease down back. Fat over ribs feels spongy. Fat around tailhead feels soft. Fat beginning to be deposited along the sides of the withers, behind the shoulders and along the sides of the neck. May have crease down back. Individual ribs can be felt, but noticeable filling between ribs with fat. Fat around tailhead is soft. Fat deposits along withers, behind shoulders and along the neck. Crease down back. Difficult to palpate ribs. Fat around tailhead very soft. Area along withers filled with fat. Area behind shoulder filled in flush. Noticeable thickening of neck. Fat deposited along inner buttocks. Obvious crease down back. Patchy fat appearing over ribs. Bulging fat around tailhead, along withers, behind shoulders and along neck. Fat along inner buttocks may rub together. Flank filled in flush.